Tamilnadu style easy Appam Recipe Without Yeast using rice and coconut. Serve hot with coconut milk or vegetable stew. Appam is my sons all time favorite dish. Appam with sweet coconut milk is something he can have everyday. This is my aunts appam recipe and comes out so good every single time. There is no addition of yeast in this Appam recipe. The appam batter ferments naturally. 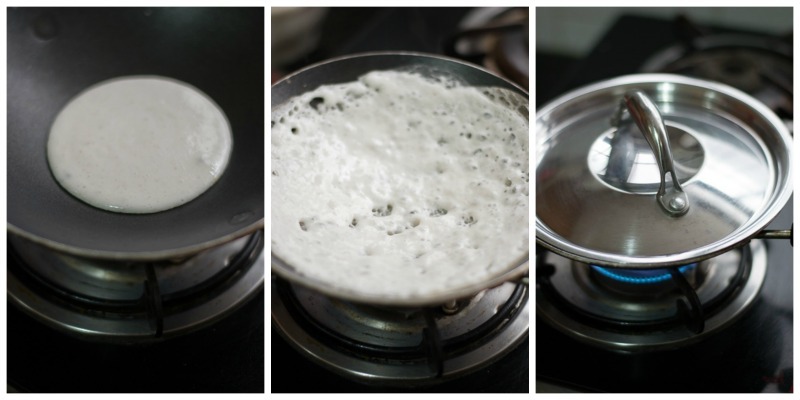 Here is how to do Tamilnadu style appam mavu or appam batter. I like to use idly rice for making appam batter. If you cannot get idly rice, you can use raw rice (raw rice variety like sona masuri rice). Wash the rice well for 2-3 times in running water. Then soak the rice and fenugreek seeds in water for two hours. We will also need 1/4 cup of cooked rice. You can use any variety of cooked rice. Also cut or shred 1/2 a cup of fresh coconut and set aside. Drain the water from the rice. Grind all the ingredients in the blender together to make a smooth fine paste. We soaked 2 cups of rice. So while grinding, you can use up-to 2 cups of water. If your blender is not big, grind it in two to three batches. Do not grind everything at a time.The motor in the blender might over heat and stop working. So have patience and grind it in batches. Cover the batter bowl with a lid and leave it in a warm place. Leave batter untouched for at least 8-10 hours. After the rest, the batter would have doubled. 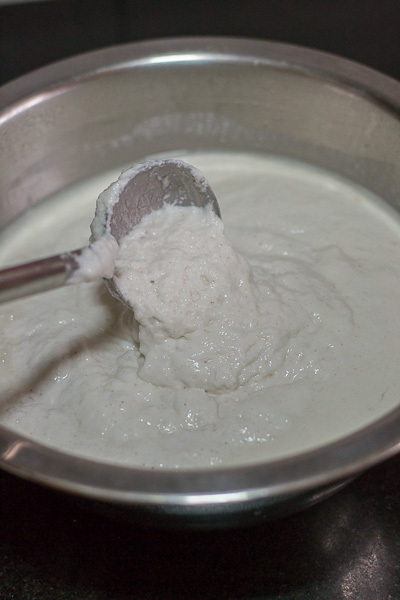 The batter would be foamy like below after fermentation. Mix well. Store in the refrigerator for up to 3 days and use when required. Now to make appam, we need to add baking soda ( also called as aapam soda ), salt and sugar to the batter. DO NOT add the soda, salt and the sugar to the whole batter at once. The appam wont fluff up. Just take how much ever batter is required for that particular time and then add soda, salt and sugar and proceed with the recipe. Transfer some of the batter to a separate bowl. I transferred one third of the batter. Add a tablespoon of sugar and 1/4 teaspoon of baking soda and 1/4 teaspoon of salt. Mix batter well to combine. The appam batter consistency should be thin. Little thinner than the dosa batter consistency. Add water if necessary to adjust the consistency of appam batter. Heat appam kadai or appa chatti until hot. Ladle some batter into the kadai in the middle. Slowly rotate the pan to make the appam batter adhere to all over the sides of the pan. Use your hands to rotate the pan in a circular motion and guide the batter to stick to all over the sides. Cover with a lid and let it cook for 40-50 seconds. Appam cooks only on one side. Appam is done when the sides are brown. Remove the appam slowly with the help of a spatula. Serve appam with sweet coconut milk and stew and it makes for a fantastic breakfast or dinner. Do not add too much cooked rice to your batter. The batter will become very sticky and gummy. We have just used half a cup for this recipe. Do not add more than that else the batter will be a mess. What can go wrong while making Appam? 1.If the holes are really big and wide and the batter is not sticking to the pan, the batter is very thin in consistency. Add more batter to adjust the consistency. 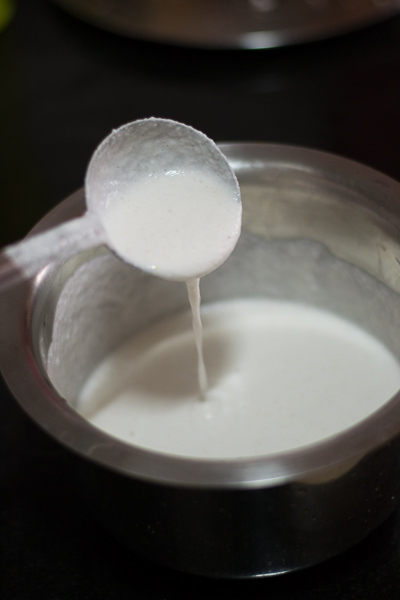 2.If the appam is coming very heavy, then batter is very thick and needs to be diluted with some water. 3.If the batter is not browning properly, it means the batter has not been fermented enough or very less sugar has been added. 4.If you added too much appam soda, appam will not be white but will be a little yellow. 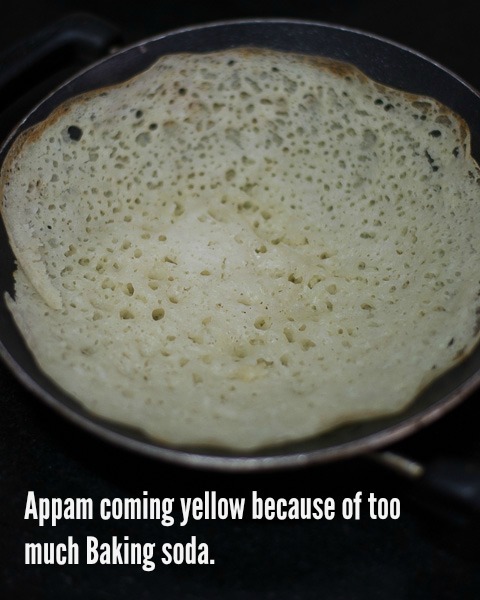 If the appam is coming yellow, then add more batter to adjust the soda. 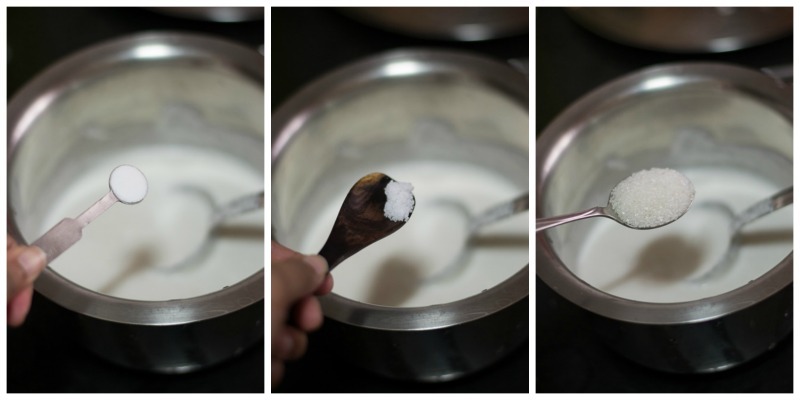 Here is the recipe for Sweet Coconut Milk. Wash the rice well for 2-3 times in running water. Then soak the rice and fenugreek seeds in water for two hours. Drain the water from the rice. 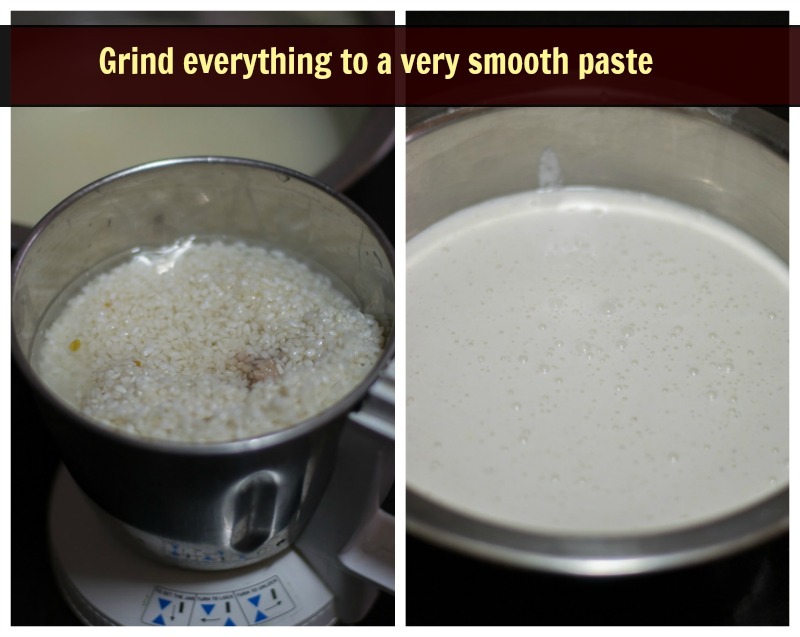 Grind all the ingredients in the blender together to make a smooth fine paste. We soaked 2 cups of rice. So while grinding, you can use up-to 2 cups of water. Cover the batter bowl with a lid and leave it in a warm place. Leave it untouched for at least 8-10 hours. After the rest, the batter would have doubled. Store in the refrigerator for up to 3 days and use when required. Transfer some of the batter to a separate bowl. I transferred one third of the batter. Add a tablespoon of sugar and ¼ teaspoon of baking soda and ¼ teaspoon of salt. Mix well to combine. Heat appam kadai or appa chatti until hot. Ladle some batter into the kadai in the middle. Slowly rotate the pan to make the batter adhere to all over the sides of the pan. Use your hands to rotate in a circular motion and guide the batter to stick to all over the sides. Cover with a lid and let it cook for 40-50 seconds. Appam cooks only on one side. 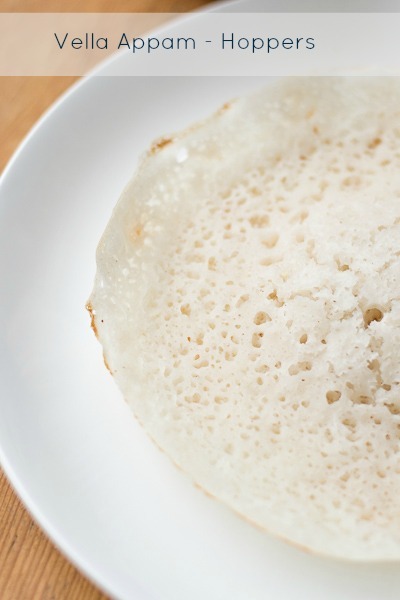 Appam is done when the sides are brown. Remove the appam slowly with the help of a spatula. Hi mam, do we need to stir the salt in the batter using hands like how we do for dosa ? abd baking soda I can use the regular one we find in market right. ( I have bluebird one ) or is it a specific appam kind ? Hi Jyoti, yes. we can use hands to stir the batter. I think you are confusing baking powder and baking soda. They are two different things. They are not same. Just ask for appa soda or baking soda in shops and they will give you. I tried making appam. Using uludhu versions..First time came out well…second time is not good ….what happened is appam is not in a shape once taken from the Appam Chetty…. Try cooking in medium flame, covered for a little more time. Dilute with little water if necessary. I tried making appam..but what happened is appam is not in a shape once taken from the Appam Chetty…. Do you grind in wet grinder or mixie ? Hi sis I am following your cooking method . It’s came out very well . Thank you sis . But add some dosai varieties and mutton briyani recipes. Bcoz your cooking was awesome and mouthwatering.once again thank you sis. Hi akka, fenugreek seeds are bitter in taste. Wonder whether it will affect the taste? Can we substitute fruit salt instead of baking soda ? If yes same measurement like baking soda ? Have never tried fruit salt for appam. Hai suguna, i read ur receipe,u says one third of the batter can use 1table spoon sugar ,1/4 tea spon baking soda,&1/2 tespoon salt. Then what quantity can i take these 3items for 2 cups of rice.? I thought of sharing as someone asked about using urad dhal for appam. Yes, many people use urad dhal as they use normal dosa pan instead of appam pan for making appam. Using urad dhal helps them spread the batter well. I make appam batter in either way and both tastes equally good. 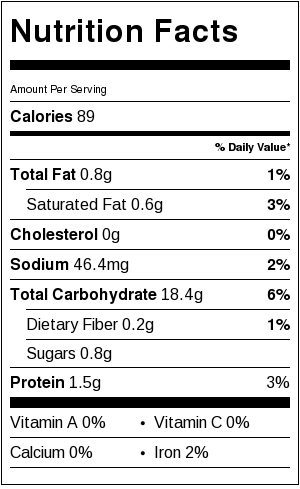 Below are the ingredients. This is my mom’s recipe as she uses dosa pan for making appam. Soak everything together for 3 hours, grind and ferment it over night. If using dosa pan, use a lid so that you don’t flip it to other side. Thats good to know Pavithara. Will try it soon. I followed this recipe, and the taste was great. But the batter was sticky. In fact I couldn’t even make it like a gundu dosai leave alone like an aapam without ruining the shape. Any pointers? My mom suggested 1 Raw and 1 Idli rice. What say you? The reason for the batter being sticky is too much addition of cooked rice. Instead of Using 2 cups of rice shall v use 2 cups of cooked rice..?? Vl it works gud..?? No. It wont work. Please do not substitute cooked rice. What would have gone wrong? May be try keeping in a warm place. Inside the oven with the pilot light on helps in fermenting during cold seasons. Hi suguna. How are you? Ive learnt to make soft dosa from you and now its one of the favourite breakfasts in our house thnks to you.. this time my doubt is regarding appams but not on how to make them but how to make them without sticking to the kadai.. had gone to kerala two weeks n i got a very very very old almost 10 year old iron appa kadai.. somehow i cudnt resist takin it from my mother in laws house as i wanted to make appam the traditional style.. normally i make appams in non stick n dos come out well.. but i was in for a surprise wen i reachd bk to dxb n tried it in d iron skillet… my appams got stuck n i just couldnt even remove a bit of it?…any idea on how to make perfect appams wit dis old appa kadai or is it time i throw it?waiting anxiously for your reply suguna..
You need to season the iron pan before you can use it. You can do this not just for dosa pan but for any cast iron pan! I have used both rice and have always come well. I do not know about using urad dal in appam. Hearing for the first time. Can i use store bought coconut milk that we get in small CANS here in USA? We do not use coconut milk in this recipe. You need shredded coconut. Can I use grinder to grind the batter? Hi can u suggest how I can make this spam without yeast or baking soda ? Hi kindly suggest if we can make this appam without yeast or baking soda ? you can leave out the baking soda but the appam will not be very fluffy! I tried out your appam with Thenga paal and Vegetable kuruma, simply out of the world experience. My whole family enjoyed the complete meal. Simply lip smacking, finger linking good food. I found it easy to prepare, make and serve with your recipes. Thank you!! Thank you so much Madhoo! Glad you liked it! Made this fantastic appam last week. My hubby and children loved it. Will be making it again for my son”s birthday (23/7) for b”fast’. Thank you soooo much for sharing this simple receipe. Thank you so much. Really glad you liked the recipe. I chanced upon yr site when looking for interesting recipes. Tried appam today yr way, and turned out well. Usually I will add the baking soda and salt after grinding. Fantastic. Is sugar required in the batter? Its just a little sugar. It helps in browning. You can skip if you dont want to add sugar. Greetings from Malaysia! This recipe has easy to get ingredients and i am so motivated to try. It will be my personal achievement if Appam comes out smooth without sticking to the pan! Lol. BTW, is the yeast version recipe out yet? Thanks Priya. Not yet. Will post soon! U can skip both yeast n soda if u use coconut water to grind instead of water. The appam ll ferment well n ll be soft as in restaurants.if u use cocunut water that collected 3\4 days ago,the result all be very good. Thank again for ur post. Thats good to know. Will try. How much fenugreek seeds do we need ? There is no yeast in this recipe. You can omit the baking soda if you want to but the bubbling action will be a little less. Does one have to only mix salt, sugar, and baking soda into 1/3 of the batter? If we want to make all of it can we just triple the salt, sugar, etc. and add to all of the batter? Thank you. Looks delicious ! This batter makes a lot of appam. once you add baking soda to the batter, you have to make appams right away. You cannot store the batter. Thats the reason soda is added in batches. I just need to know.. is it can use puzhunghal rice can use for appam. ? you grind everything to a smooth paste. 🙂 When you grind rice that is. Hi Suguna…. I tried out your version…. 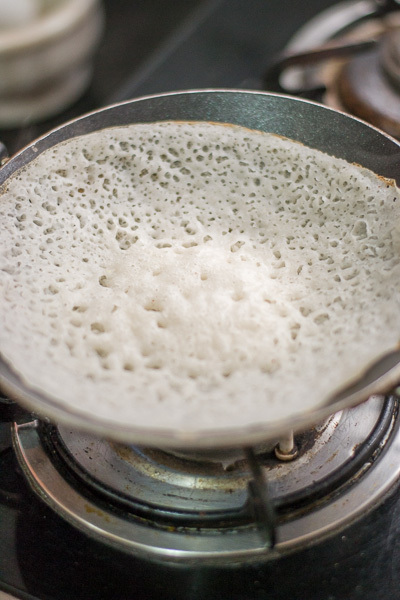 The batter did ferment as shown in the picture, but except for the first appam my second or third appams do not have the lacy texture around the edges and I am not able to get the brown edges of the appam as well, any idea what i may have done wrong. The ingredients i followed the same as you have given, the batter fermented as shown in the picture. I did also add enough water so that it is easier to swirl. 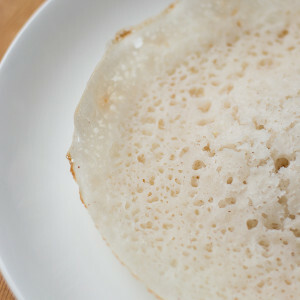 I am looking for a lacy appam, with brown edges like the one you eat in nallas. Can you please advise me. Did you cover the aapam pan with a lid to cook Indira? Most of the restaurants use yeast added to the batter. Will post the recipe with yeast soon! You can try on a dosa pan but it wont have the curve. What do we do with the coconut or milk? The coconut is added to the batter while grinding. There is no coconut milk used in this recipe.